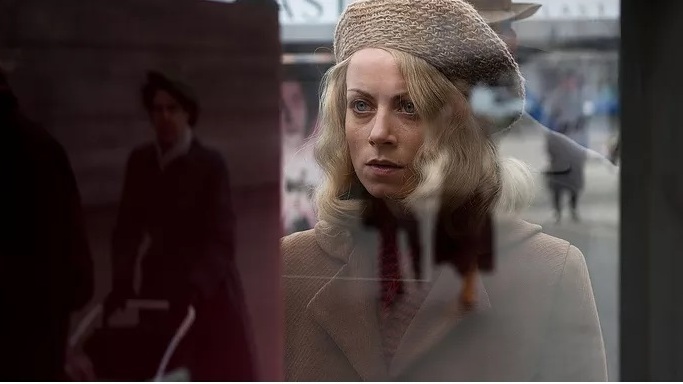 Review: 'The Invisibles' Is Part Documentary, Part Dramatization A mix of dramatization and recorded interviews with Jews who managed to hide in plain sight in Berlin despite the Nazi dragnet, this hybrid film fights against itself. Hanni Lévy (Alice Dwyer) regards herself in The Invisibles. In 1943, Nazi propaganda minister Joseph Goebbels announced that Berlin was now "Jew-free." The four young protagonists of The Invisibles know this isn't true: They're Jewish and still there. But none of them has any idea that an estimated 7,000 other Jews had thus far also escaped the dragnet. One of the terrors this docudrama evokes is isolation. The first of the four to appear onscreen is Cioma Schonhaus (Max Mauff), an art student who's just beginning to develop the document-forging skills that will allow him to live and even prosper. Before introducing the other three, director and co-writer Claus Rafle cuts to the real Schonhaus, filmed a decade ago. Rafle terms The Invisibles a "hybrid." Like the recent Who Will Write Our History, the film mixes reenactments, archival footage, and relatively recent interviews. But the two movies balance these ingredients differently. The Invisibles is mostly dramatization, which makes the interviews distracting. They're interesting on their own, but here they play like DVD extras that managed to infiltrate the main feature — and sometimes hold it hostage. After watching his parents deported to concentration camps, Schonhaus takes to renting a different room every night, posing as a soldier who's about to be called up. Later, he takes refuge in the Afghan embassy, where he continues to fabricate IDs. Unlike the men, Ruth Arndt (Ruby O. Fee) and Hanni Levy (Alice Dwyer) don't face the dilemma of explaining why they're not in uniform. Hanni dyes her hair blonde and spends much of her time in public, sometimes wearing a veil to pose as a young war widow. Ruth becomes the housekeeper for a German official, wondering all the time about the fate of her brother and her boyfriend. The filmmakers simply don't have the means to depict Berlin in the final year of the war, when Allied bombers pulverized most of the city. (Instead, they insert period documentary shots of rubble-choked streets.) They also maintain an all-too-sober tone. Not for them the panicky eros of Aimee and Jaguar, the 1999 real-life drama about love between a Jewish woman and a Nazi officer's wife in wartime Berlin. The Invisibles offers an attractive young cast and a you-are-there tension that can't be conjured by interviews conducted 65 years after the events. Yet it feels like a footnote to the documentary that occasionally intrudes. Putting the two together functions as subtraction rather than addition.